Friday’s storytelling session at the A.C. Hunter library was jam packed, with “just a little squeeze space left,” as host Catherine Wright pointed out. There were a slew of kids seated on the floor at the front, while parents, storytellers, and other intrepid adults hung towards the back. Why had we come here? Anne Glover, who tells stories incorporating nimbly looped string figures (think Cat’s Cradle), had come to tell her stories for kids. Many of the kids and grownups here had already seen Anne this week—some through Anne’s school performances, some at her workshop, and some at Tuesday night’s Story Circle—and everyone seemed excited and ready for more. But first, we were treated to stories by two young storytellers: Benjamin Wright, age 11, and Julianne Taylor, who is a Grade 6 student at St. Mary’s Elementary. Benjamin told a story he made up himself, called “Tom and the Talking Fish.” His mom, who was also the host, said the story was “inspired by Benjamin’s love of nature,” which was easy to perceive. Benjamin’s tale was set in a pond by the forest, and his cast of characters included water sprites, a talking fish, and pixies with magical powers. Julianne followed this with her telling of “Snow White and Rose Red,” a Grimms fairy tale about Snow White and her redheaded sister (but technically not that Snow White: see https://www.bustle.com/articles/151361-who-is-rose-red-snow-whites-lesser-known-sister-is-getting-a-disney-movie). The pair make friends with a bear, but run into some trouble with a malevolent dwarf. When Julianne voiced the dwarf’s complaints (crying out “Me beard, me beard! You cut off me beard!”), everyone started to giggle. Anne Glover then took the floor, beginning with the tale of a baby rabbit who’s often left home alone. Throughout, Anne showed us her string figures—a turtle in the baby rabbit’s picture book, a fox running along a path—which always yielded much oohing and aahing. But Anne’s stories for kids are also full of gestures, some coming from sign language, which sparks mid-story guessing games. At one point, she slowly swayed an upright arm in the palm of her hand. This meant “forest,” and everyone mostly got it. Anne then invited five kids up to show some easy string shapes that kids could make. Together, they made string puddles, string teeter-totters, string tear drops, string platefuls of spaghetti, and gigantic giddy string grins. She closed by teaching everyone a string trick, “like a magic trick,” letting us in on a secret while likewise dazzling us all. 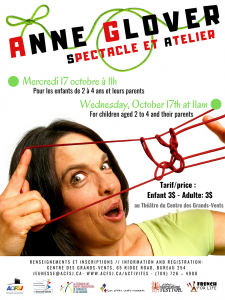 Any french-speakers with children aged 2 – 4 are invited to a string stories workshop / performance with Anne Glover at the Centre des Grand Vents, 65 Ridge Road on Wednesday, October 17th at 11 am! Our Wednesday story adventures began with a Community Culture Circle at the St. John’s Native Friendship Centre where activist and storyteller Tshaukuesh (Elizabeth) Penashue shared stories and fostered a lively discussion of Innu culture. Next up, we headed to the Engaging Evenings event at The Rooms where Shoshana Litman ensured that the event lived up to its name. The audience was indeed fully engaged in her traditional stories from Israel, Afghanistan and Somalia and even lent their voices to a charming chorus to accompany the tales. 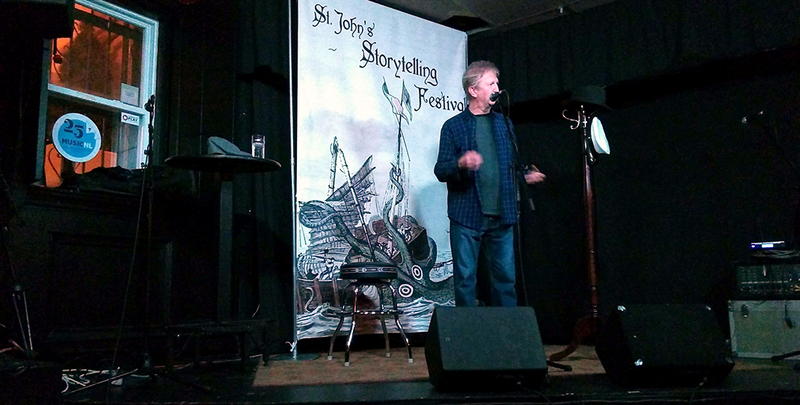 After ending on that high note, we traipsed over to ‘Ships at the Ship’ where host Randy Crane presided over an evening of stories that explored our complicated relationship with the sea. Randy’s stories gave us a vivid glimpse into the hearts and minds of shipwreck survivors. We all felt as if we were right there with them, crowded into the Marconi House on the Florizel, or clinging to the rocks on the shore waiting for rescue. Just listening to him caused a huge storm of emotions. Lynn Hamilton McShane and Eugene Kane also told a Florizel story, recounting a 1980s interview that Lynn did with her Pop, Tom Kane, one of the men who participated in the rescue and salvage operation after the wreck. Hearing his despair, his sadness and his resignation to the facts of a life near the sea was sobering and powerful. Between the intensity of the shipwreck tales, we had stories of a lighter note. Dave Paddon’s recitations were charming, as always. In the first, we were carried along into a game of one-upmanship as two men tried to claim that they each had the better boat. We’re not sure it ever got sorted but we enjoyed listening as they tried to figure it out. And in the second, we found out all about how hapless boys went a bit astray while on a task for their mother (spoiler: she fixed it all up after). Christine Hennebury told a couple of what she called ‘ship-adjacent’ stories. In the first, she reframed the story of a Siren into a feminist tale of a woman who just wanted to do her own thing. Her second story featured the vicious last words that the Pirate Anne Bonny said to her husband (note: those words were NOT love-adjacent). Jim Payne’s stories about his brother being saved by a spirit boat and about the devil making a bad deal were delightfully rich in the daily details of life in fishing communities and spoke to a long history of shared understanding of the ‘the way things are here.’ If you ever have to make a deal with the devil, ask Jim how to get the upper hand. Between Sirens and punts and shipwrecks and spirit ships, we had wave after wave of emotion at Ships at the Ship and we loved being along for the ride. On Tuesday evening, the festival began with a Story Circle held above Rocket Bakery. Three storytellers—host Kelly Russell, Sharon King-Campbell, and Anne Glover—were slated to tell their stories in turn, along with anyone who wished to join the circle as part of the open mic. Nine storytellers were heard all told, including Dave Paddon, Stella Mair Evans, Patrick Kennedy, Gaurav Madan, Karen Carroll, and Angus Anderson. The stories were set in both the faraway past and the here and now. We heard true life tales of incredible feats (such as running from Quebec City to Montreal in five days straight! ), recitations about vegan sea creatures and talking ninja caplin, and a Jack tale explaining how Jack, the fairies, and the leprechauns came together and outsmarted some dastardly land developers. We heard folktales from way back when, a heartfelt ode to molasses and bread, and a modern day meeting of wits on Water Street. As they told their tales, some storytellers wielded mittens and rhyming couplets, while others used concertinas and string. But whatever their means, each teller unquestionably held the rapt attention of the room. Kelly Russell began the Story Circle, leading with his memories of renowned fiddler Rufus Guinchard. At the time of their meeting, Kelly was 19 and Rufus was 77, and Kelly introduced himself by way of playing one of Rufus’ tunes, which he’d learned from a tape in MUN’s Folklore Archive. After describing this iconic moment, Kelly went on to play that very tune. At first, I almost felt taken aback—were we really listening to the tune that had started it all, before the duo began touring internationally? Kelly continued, telling more stories of tunes before playing the tunes—including how Rufus once woke him with a tune suddenly remembered (“Kelly, Kelly, wake up! I got another one!”­­) Every melody felt more and more resonant. 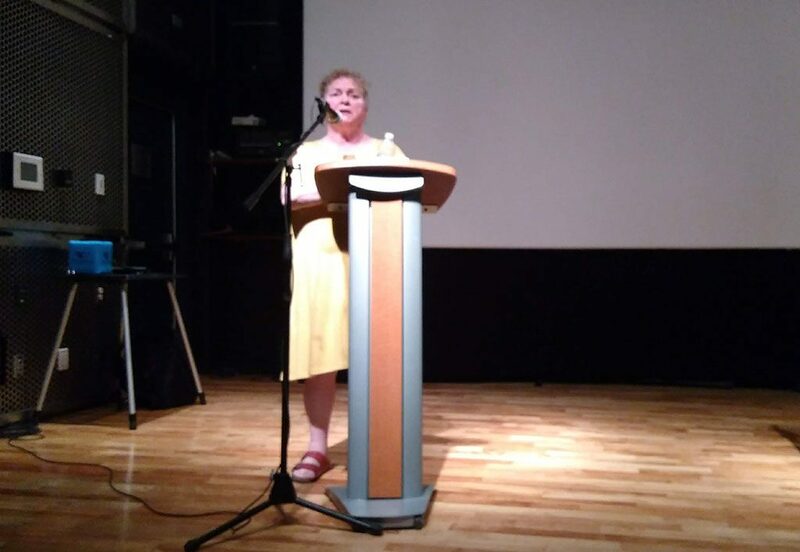 The next featured storyteller, Sharon King-Campbell, told stories about her grandfather, Frank, a well-read man with “long arms and nimble fingers” from Stratford, Ontario. Whether he was riding barrels over Niagara Falls to prove his sea legs, or winning bets for his vocabulary, Frank’s ingenuity always shone through. Sharon’s stories unfolded like folk tales set in the 1930s, and Frank’s tricky triumphs were easy to root for. Anne Glover’s incredible String Stories! Anne Glover, the last featured storyteller, wowed the crowd with her characteristic “string stories”— stories wherein key images and characters are formed through the manipulation of cat’s cradle-style string. Anne can loop string into houses and chairs, turtles and dogs. She can make a knotted bird slowly fly through the sky. What’s more, Anne performed all the characters in her story—including a snake, a chicken, and the mythical Anansi spider, amongst others—with total conviction. As Anne showed her string images around the room, taking care that everyone could see, I was reminded of seeing a picture book read aloud. But with Anne’s stories, the images are created in real time—you can witness the construction—and the looped figures carry a certain timelessness, while hinting at just enough of a form to spark images in the viewer’s mind. Anne Glover’s string stories are truly not to be missed. She’s leading a string storytelling workshop on Thursday evening (October 11), telling stories to kids (and adults, as she assured us!) 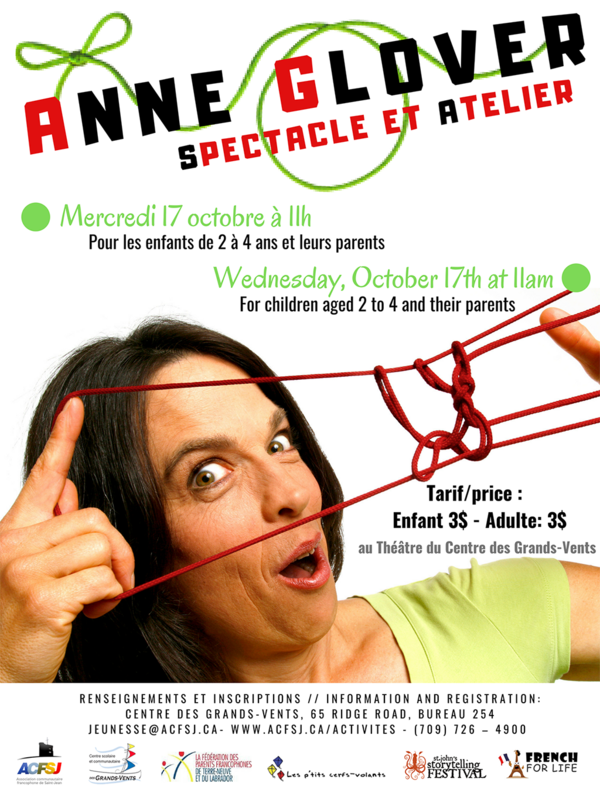 on Friday afternoon (October 12), and telling stories for Francophone toddlers and parents on Wednesday, October 17. For more details, click here! 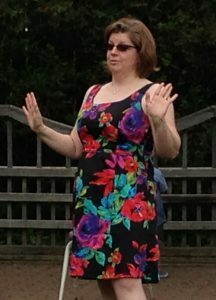 Kelly Russell plays a jig to kick off the festival at our Story Circle! The smiles on everyone’s faces at our Circle last night told a tale of their own, and it was the story of having a great time at our first Festival event for 2018! Our featured teller, Sharon King-Campbell – who spent time over Thanksgiving Weekend practicing as she walked around town – shared some treasured memories of her grandfather, Frank. Now that we’ve all about his adventures, his handiness, and his expansive vocabulary, we feel like we know him all to pieces. Dave Paddon was on hand to share a hilarious recitation about a kitchen full of fish that had us all cracking right up. You can catch more of Dave’s terrific foolishness tonight (Wednesday) at ‘Ships at the Ship’ at 9pm. After feasting on Rocket’s delicious treats during the Intermission, we were back with more glimpses of the story delights that lie ahead this week. Gaurav Madan, who will be part of Tales from Near and Afar on Saturday, told us an epic tale of a 5 day run from Quebec to Montreal. The story was terrific and, by the end, our legs were tired in sympathy! Angus Anderson, who will be back for Homespun Tales on Friday night, had us all in stitches with his anecdote about telling time with the sun. We enjoyed finely tuned tales from a few more open mic performers before closing the night with our visiting teller Anne Glover. Anne wowed us all with a real treat: an Anansi tale. We didn’t get video evidence but we are pretty sure she actually turned into a turtle, a chicken and snake right there on stage! We also got a chance to see her magical string come to life. Her workshop on Thursday is going to be amazing. After months of planning, we’re just a day away from the start of our Festival and we are so excited to get the stories going. …and that’s just the beginning of the variety of stories and tellers you’ll see at this year’s Festival! Are you wondering how all of those styles and ideas will blend? The answer is that they will blend PERFECTLY. It happens EVERY time. We just love the way all of the tellers mix during our Festivals. It doesn’t matter whether they are meeting for the first time or if they have known each other for years, their passion for storytelling lets them find common ground and encourage each other. Have you ever watched a storyteller relish another teller’s stories? It’s incredible to see. It might be that they have heard this story develop through various retellings, so they know all the ins and outs and enjoy the familiarity of the tale. Or this story or style might be new to them and they enjoy it both for the novelty and for the skill involved in telling it. If you watch a teller listen to someone else share a story, you’ll see smiles of recognition, sparks of surprise, and nods of appreciation because storytellers can admire the craft even as they get caught up in the tale. The fun of seeing tellers immerse themselves in each others’ stories is just one of the joys of of the Festival for us. Another thrill is seeing the audience get carried away by a story. When everyone first sits down, they get to chatting and there is a friendly buzz in the room but once the tellers get started a certain wonderful quiet falls. It’s almost like the room falls under a gentle spell and you can see everyone smiling, nodding, jumping in surprise together as the storyteller’s magic takes hold. Bringing that sort of ‘caught in the moment’ peace to a group of people is one of the reasons storytellers enjoy their work, and it’s definitely one of the reasons we host the Festival. Another joy of hosting this festival comes from seeing all kinds of people jump into the fun and challenge of our Festival workshops. New tellers taking their first brave steps towards the stage, established tellers gathering new threads to weave into their tales, teachers, youth group leaders, actors, writers, and all kinds of others trying out some new techniques for their own work, and on then, the workshop leaders cheering them all on – it’s just amazing to be part of the whole thing. We hope to see you this week, in the audience, on the stage or in a workshop, and we hope you enjoy our Festival just as much as we do! Top of the Mornin to ya B’ys! Attending the past two parts of the Summer Series was a blast. I look forward to capping it off with the finale, and making a hat trick out of my storytelling event summer adventures. This third act is featuring Bev Kane and Jim Payne, telling Newfoundland stories with a shot of Irish flavor. This time it’s only me, I’m not dragging anyone along. I finally get to the Benevolent Irish Society building after going to the wrong address. I am then greeted by Kailey, and I help them set up the banner. As set up finishes, I plop down at the table by the door, taking the admission of people who come in. The venue is spacious; the chairs are laid out in a semi-circle, and the banner is behind the microphone stand. I notice that there is a bar here too. The audience find seats, making small talk with others around them. That feeling of being comfortable and welcomed fills the room like air in a balloon. I know I’ve said this before, but it’s one of my favorite things about storytelling events and something that deserves more recognition. Kailey goes to the mic to introduce the tellers. I fix my glasses on my face and take out my journal, I’m ready to listen and take notes. Without missing a beat, as soon as Kailey starts talking, a respectful and attentive silence encases the audience. Jim Payne is the first to speak, and he begins to tell a tale about a fellow named Dickie, who’s very short. “… by and by the once,” he says, earning a chuckle from the audience. I notice that in this story, there’s a lot of repetition of sentences. My brain switches into folklore mode as I analyze and identify the elements of this folktale. Jim breaks into song mid-story, and the audience stomps their feet to the tune. His next piece is a recitation that was written by Len Snow, about Summer in Newfoundland. “The car will stir up clouds of dust,” Jim recites, and once he finishes the recitations, and everyone in the room gives a round of applause. Bev Kane is next, she introduces her stories with a little bit of background info, highlighting her trips around the Southern Shore to visit her in-laws. Her first tale is a Jack story called “Hard Arse.” I open my listening ears as much as I can, as Jack Tales are one of my favorite kinds of folk tales. “Every story has a Jack,” she says, continuing to talk about the magic boat and the crew Jack gathers on his journey. Bev engages the audience, and I watch in awe. When I start telling stories, having audience participation is an aspiration of mine. I smile and a feeling of admiration and awe bubbles in my belly. “Will you give me a birth, for God sakes,” the audience responds exactly on queue. Her story is earning lots of laughter from the audience. I decide that Hard Arse is one of my favorite stories I’ve heard so far. Her next story is about a house party, and she finishes that bit with a song. “About six in the morning… stole her hard wine,” she sings. After the song is finished, the audience claps and cheers. Once Bev steps away from the mic, Kailey announces that a short intermission is happening. I say seated, adding a couple of new story ideas I have on to a page in my journal. “I’m full of useless information,” Jim says, returning to the stage, and the audience responds with laughter. Jim delivers a fabulous Irish recitation. I notice again that there are repeated lines that drive home the humour. “Who’s the five did you say?” he says for the third time, and a chuckle arises from the crowd. He nods to Bev and sings a song called “Ballad of Nelly Purchase.” It is about a woman whose husband was killed at Beaumont Hammel during World War II, and has not come out of her attic since. The song is haunting, even more so when the audience croons along with Jim during the chorus. When it ends, the crowd claps respectfully. Bev takes the stage again with stories from her experiences on the taxi that goes from the Southern Shore to St. John’s. “You’re in labor? No, I split my head open,” she says explaining that she slipped and fell one day while pregnant, and her husband was worried sick that her water would break so he sent her to the hospital on a taxi. She then sings a song about a woman who went to St. John’s on a taxi and stayed in a boarding house, never going back to the bay. Once again, the crowd erupts with applause. Jim closed out the event by singing a song and playing his accordion. Applause roars from the audience again. The frequent cheers add to the supportive and encouraging atmosphere of storytelling events. I believe it’s an important staple in the storytelling event recipe. As the evening winds to a close and the crowd mulls out of the building, I help Rebekah and Kailey put the banner away. Once it’s done, I get a ride home from Rebekah. “Thanks,” I say, getting out of the van. “You’re welcome, will I see you Tuesday?” she asks with a smile. “Of course, see ya at The Crow’s Nest Officer’s Club then,” I reply, a huge grin on my face. I unlock my door, and I’m itching to tell my roommate about the awesome night of stories he missed out on! We finally arrive at The Rooms, just before the stories begin. 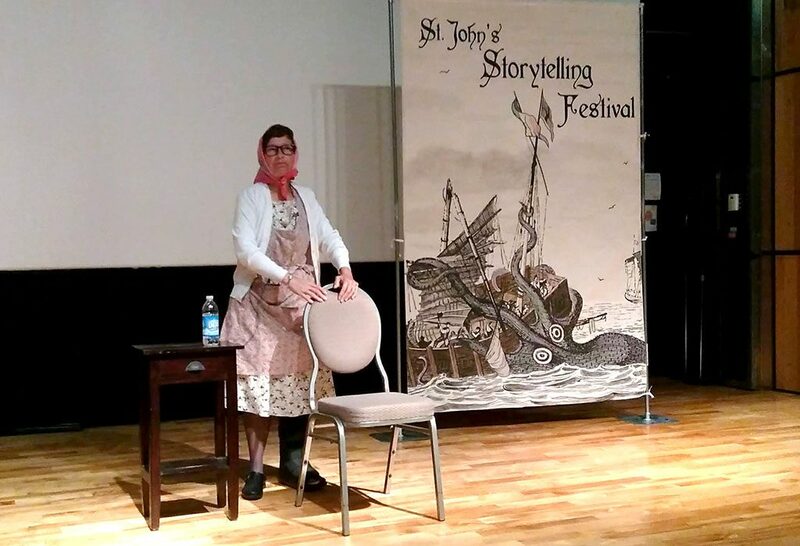 I greet the women at the admissions desk, and tell them that I work with the Storytelling Festival. “Claire with the dark hair?” One of the admissions women ask, looking at what I assume is a guest list. “That’s me!” I reply and flash a smile. “Yep.” Allison replies, getting cash out of her wallet. “You’ll have to pay.” The lady says with a chuckle, Allison replies with a nod. She takes her button, putting it on her shirt. “The theatre is upstairs.” My cousin replies, pointing to the sign a floor up that says ”. “Right, yeah.” I scratch the back of my neck. “I uh, knew that.” We make our way into the theatre. When we get there, the Festival Admin Kailey has already started their introduction of the nights tellers. As they speak, Allison and I make our way to the back, as to not disturb or distract anyone. The event once again did not fail to bring out a crowd, and I feel a sense of accomplishment and pride swell in my chest. I’m glad Allison can’t see me at this moment, as she’d probably ask what I’m smiling about. The theatre is ‘high quality’ for lack of a better word. The lighting resembles that of a concert hall, and I notice professional production equipment in the room behind us as I look at my reflection in the glass. The atmosphere feels warm and welcoming, which I notice is a constant at storytelling events. While the theatre is not as rustic as The Crows Nest Officers’ Club, or as open as The Lantern, I still feel a wave of relaxation and comfort wash over me as I get comfortable in my seat. As the first teller gets up on stage, the familiar blanket of attention and respect covers everyone in the audience, from ages eight to eighty. Karen Carroll speaks first, dressed in costume. I infer that it resembles what women wore ‘back in the day’. She begins with a tale about her mother and living in an old salt box house in Carbonear. She mentions how as a young child, she never thought much of how much work her mother did. “… Like an orchestra conductor,” Karen says of her mother, and talks about how while parenting has evolved, the tasks are still the same. A mother still puts clothes out on the line to dry. She then presents a recitation she wrote about household chores. “Stories written on my heart and in my mind… clothes on my line.” Applause fills the theatre as Karen finished her poem. Intermission starts, so Allison and I get up to stretch our legs. “Wanna find something to eat?” I ask my cousin, as I remember that neither of us have eaten supper yet. Allison nods, and we head up another floor to the cafe. Along the way, we run into my pal Rebekah Nolan who also works in radio and folklore. We chat with her briefly, then continue on to the cafe. Allison decides to get a caramel coffee cake muffin. As the intermission ends, my cousin and I sit our bums back in our seats. Karen takes the stage again, this time telling a story about her grandmother. She talks about a pair of brothers who married two women, both named Liz, referred to as Pat’s Liz and Mick’s Liz so no one got confused. The story details the lives of these two very different Lizzes, with lots of wit and laughter from the crowd. “God bless em now, they’re all in the graveyard and peace is with them now,” Karen finishes. She then delivers another recitation called “The Tale of Two Lizzes.” The audience gives a round of applause, then Anita comes back up to close the show. She tells a story of a midwife named Kit McGraw, who knew that nursing was a dangerous occupation, and who never let horrendous weather stop her from delivering babies. Anita mentions one particularly harrowing delivery amidst a terrible storm, but which has a punch line at the end that puts the audience in stitches. Anita tells another quick story about a woman who was taken by fairies, and the trials and tribulations that allowed her husband to bring her back to life. The event comes to an end, Allison and I wait around the outside of the theatre for Rebekah, as she’s walking home the same way we are. I breathe a breath of satisfaction, feeling glad that I stated going to storytelling events. I decide right at this moment that I’m not gonna stop being involved with storytelling anytime soon. Ever since I began university, I wanted to attend storytelling events. For my first couple of years, I watched from afar and heard whispers about this so-called Storytelling Circle from family and people I encountered who are involved with the local folk art community. I read the newsletters, and every month I thought about going but was hesitant to go alone so I never went. Tonight. I have a summer job with the Storytelling festival as the Programming and Promotions Assistant. I took the opportunity to go, with the comfort of knowing people I know will be there. I grab my friend Josh, who also has been wanting to go to these events but not alone. We take the bus down to The Crow’s Nest Officers’ Club and were genuinely confused about how to get in. “It says members only?” Josh says, looking at me with a puzzled gaze. “It says to let the staff know that you’re there,” I reply matter of factly. “C’mon, let’s go in.” Being the impulsive person I am, I open the door without hesitation. “Do we go down there?” He asked once we went through the first door. “Hmm, I think it’s upstairs. I hear voices,” I answer. Josh nodded and followed me up a very narrow and steep staircase. Once we got to the top, it was pretty obvious why this place has ‘crow’s nest’ in the name. Looking out the windows, you could see the city’s harbourfront. We were greeted by Kailey, the storytelling coordinator, and the rest of the board. We introduce ourselves and sit down. The ambiance of the bar is rustic and replicative of a ship’s cockpit. The walls are covered by ship crests and other nick knacks, the atmosphere friendly and warm. Josh and I find a table to sit at, and wait for the tellers to start. “We’re the youngest people here,” I say with a chuckle, looking around. The bar is packed, and I’m impressed that the Storytelling Circle has such a robust audience. “Yeah, but I’m okay with it,” Josh replies with a grin, and I nod in agreement. The host, Charis Cotter stands up next to a stool and the front of the bar and introduces herself as a collector and teller of local ghost stories. I notice the audience coming to attention as soon as she starts talking. Everyone is very attentive and respectful, it’s a reassuring and relaxing environment. “… please God, not again,” Charis says as she finishes a story about disappearing ships. She then introduces the next teller, Angus Anderson. Angus talks about growing up in Nain, and the stories he heard from his older relatives about encountering European settlers on the coast of Labrador. “Avoided them for the next hundreds of years,” says Angus, as he talks about how the community of Nain came to be. The next teller is Daryl Williams. He delivers a tale about traditional Newfoundland meals. “My mother who was a fantastic cook..” he says and describes the enterprise stove she used. Daryl finishes with a ballad like recitation about his love of homemade bread, and the audience claps. Two guests from Israel perform next, an Israeli folklorist named Yoel Perez, and his son Hagay. Yoel tells a story about a little boy playing hide and seek with a pupil of Mohammad. His son tells a story about a king. Their stories serve as a preview for a special event the following night. As they finish, the bar once again erupts into applause. Hmm, I can get used to this kind of support! It’s about halfway through, and intermission begins. I catch up with a friend and fellow radio enthusiast Rebekah Nolan and go on a hunt to find the bathroom (which I did). As the next teller after the break begins to talk, I realize what time it is and frown. Unfortunately, I gotta go. Josh and I say our goodbyes (quietly of course, so as not to distract the teller) and make our way to the bus stop in the pouring rain. “That was fun.” I tell Josh as we got on the bus. “Same time next month?” I ask with a grin. “You know it,” Josh smiled back. We are wishing our outgoing President Christine Hennebury the best possible luck in all her future adventures! Christine is an artful and successful Creative Life Coach! She’s fabulously sensitive and insightful, with a unique ability to help you define your obstacles and find achievable ways around them. And she uses storytelling as a tool to help re-train the brain and make room for your creative pursuits! Christine is the founder of the Association for the Arts in Mount Pearl. AAMP hosts the ArtFusion festival annually, where you can enjoy performances, art-making, storytelling, music, and more! Christine is also a compelling writer! You can enjoy some of her flash fiction by following her here, on facebook. Christine has just released a free e-publication of her novel Disconcerted! Did we mention she’s a compelling writer? She will be deeply missed by everyone here at the Festival, and we’d like to thank her for her years of committed work and wonderful storytelling!